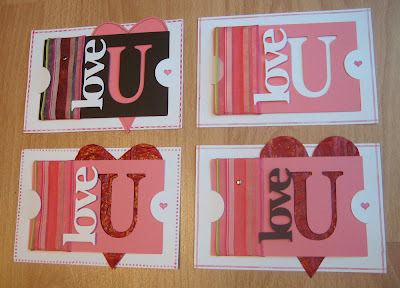 Time for a quick Valentine's Day post, and some Valentines to go along with it. 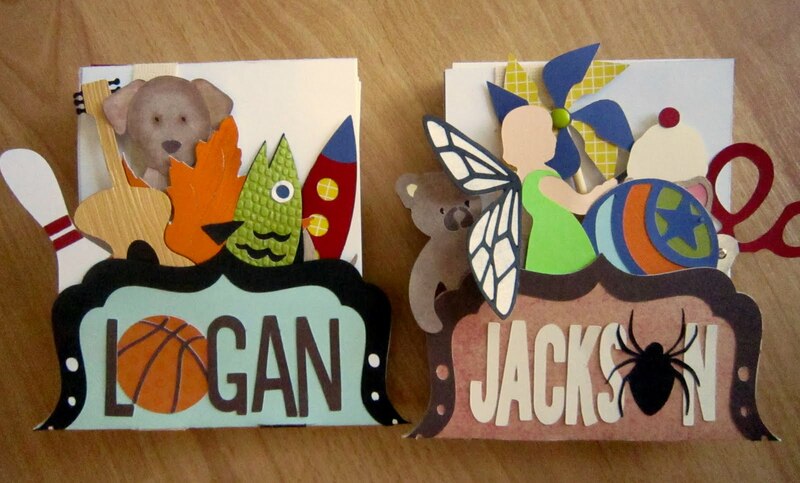 Pieces are cut with the Graphically Speaking Cricut cartridge. The textured red paper is a leather-like wrapping paper. 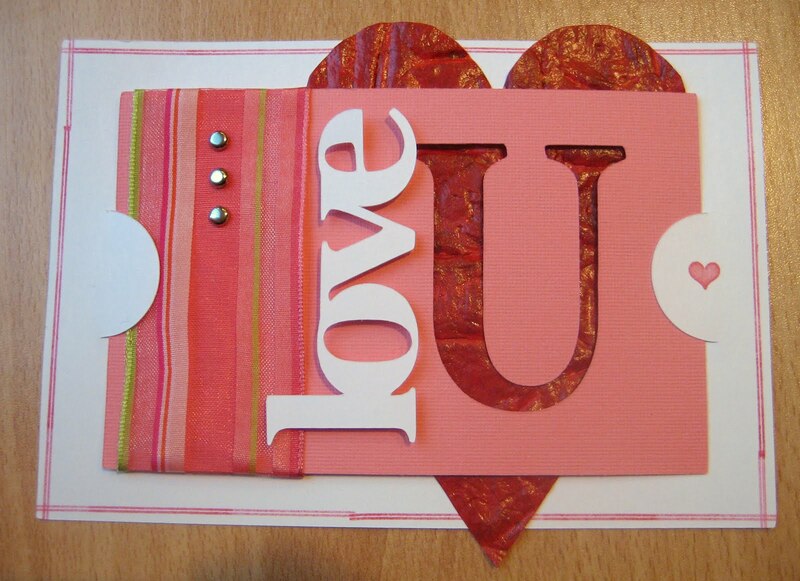 And here's the hidden message once the "love U" is removed. Super quick, and easy to make a bunch of them! Anyone else let out a "whoa" the first time you saw those bags of giant marshmallows at the store? All I could think about was how big they would get in the microwave! I haven't nuked one yet, but I did make one of the cute treats that I saw on Pinterest. 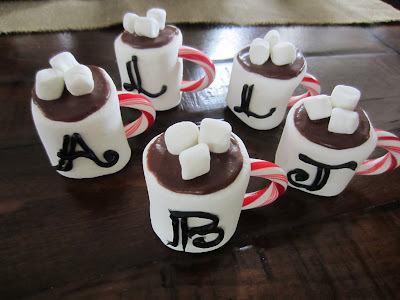 Marshmallow hot chocolate mugs! So easy. 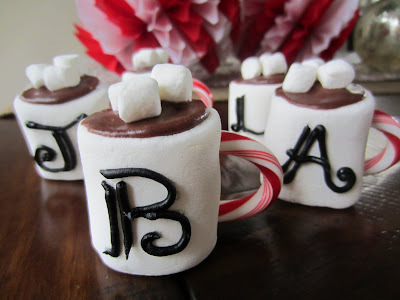 Stick the top of a candy cane into the side of a giant marshmallow for the mug's handle. Frost the top with chocolate and put a couple mini marshmallows on. Then customize your "mugs". Hearts for valentines, numbers for a birthday party, or in this case I did initials for all the kids at a New Year's Eve party. The kids loved pretending to sip their hot chocolate! This month's Papertrey challenge is to take a project you made last year and use it for inspiration on a current project. 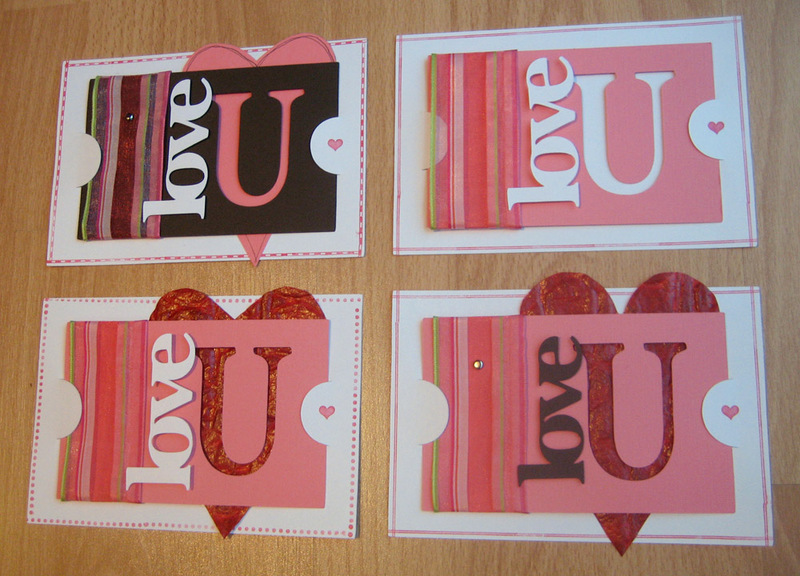 I need to make 15 cards for a card exchange this weekend so this gives me the direction I need. 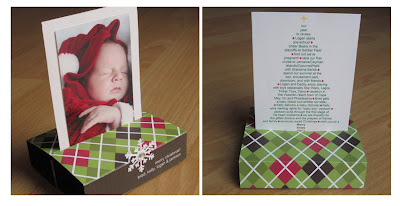 I've been meaning to do another pop-up card like the Christmas cards I did. So I came up with a pop-up flower card. It's pretty quick to make once you have the measurements. 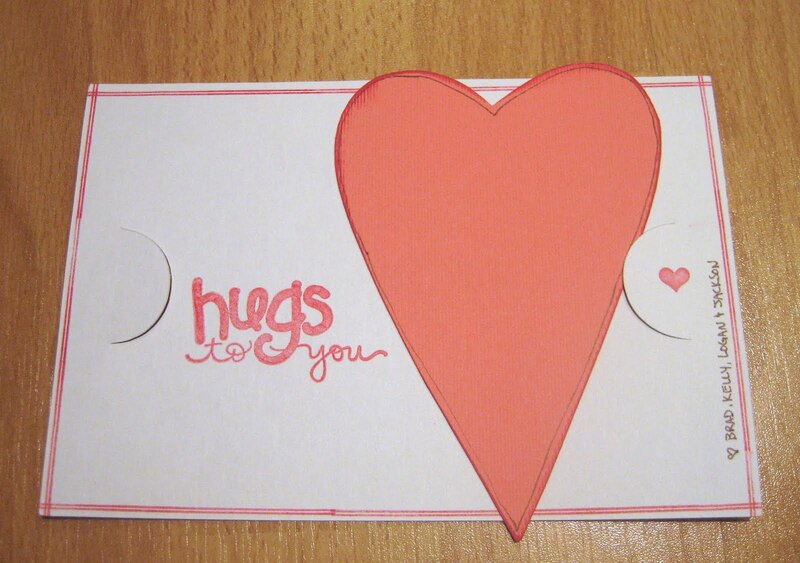 Start with a 4" x 11" paper for the base (double sided paper is great since you will see the inside). Score at the following increments: 1", 2 3/4", 3 3/4", 7 1/4", 8 1/4", 10". 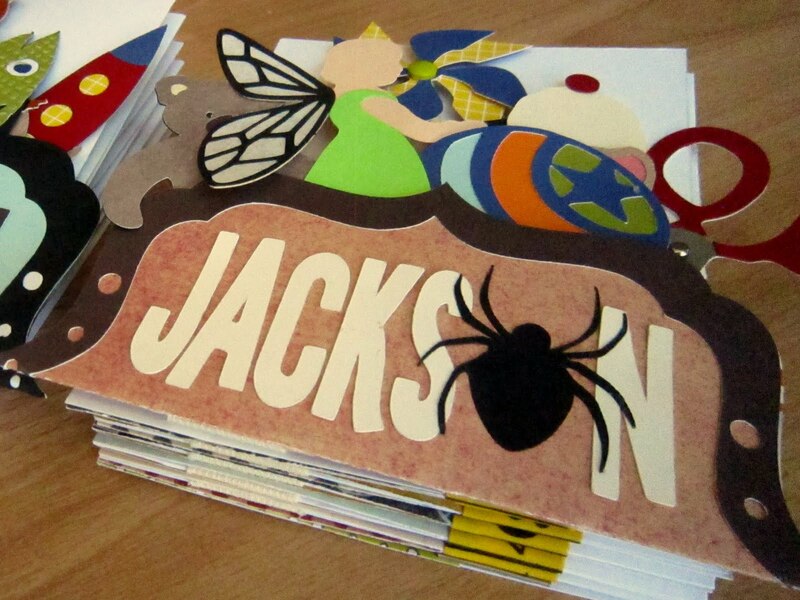 When you fold them all in the same direction you will have a base that looks like a "B" from the side. 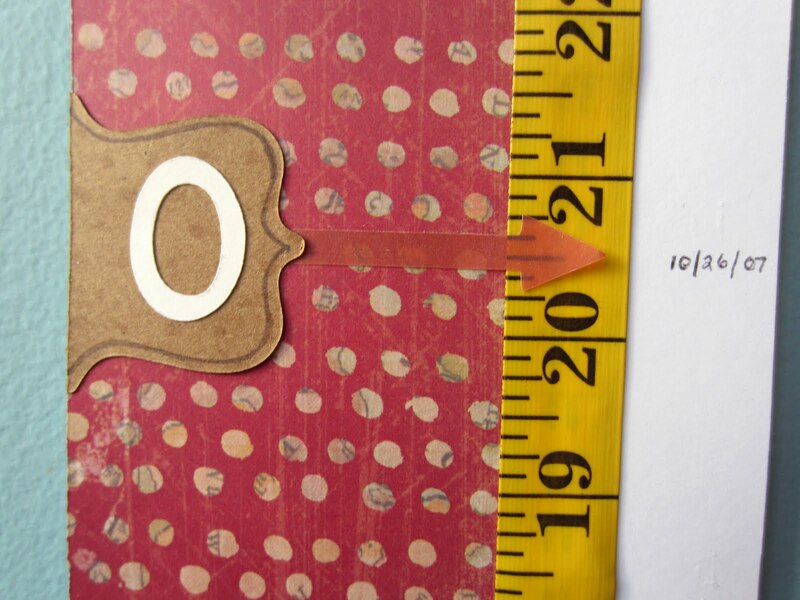 Unfold the paper and make another score at 5 1/2". Bear with me, there are a lot of steps here, but it is easy. Cut a 2 1/2" slit in the middle of this score line, and cut another slit super close to that one to make a slot for the clear acetate piece to pop out of the base. It should be 1/8" to 1/16" wide. You want it pretty snug to hold the acetate up. 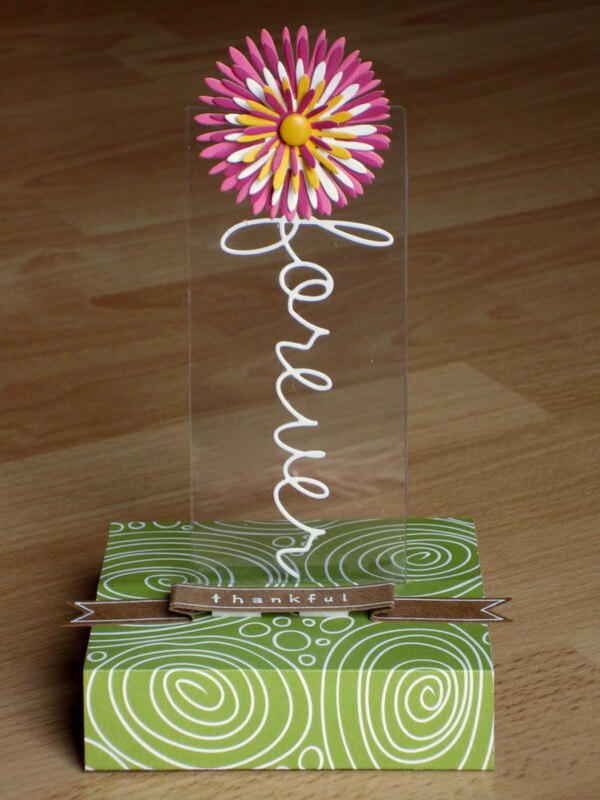 Cut two pieces of clear acetate that are 2 1/4" wide and however tall you want. One piece should be 1" shorter. Slip the longer acetate piece through the slot, and using the Tiny Attacher or regular stapler, staple the long piece to the 1" segment at the end of the base. You can use adhesive to attach the two end pieces of the base together. I used Papertrey's Wonderful Words die to cut the words. Love how the long loops of the letters (like the "f") look like leaves when oriented vertically. 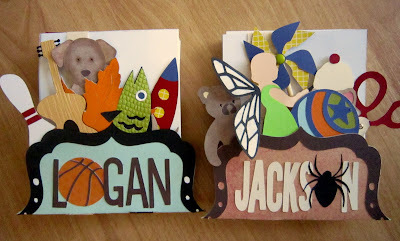 Use a little glue to attach the word to the acetate. Place the other piece of acetate that is 1" shorter on top. The bottom of the acetate will just be resting on top of the base. This is important because it will essentially act as a ceiling and hold the base down nice and square when the card is open. I attached the two pieces of acetate with the Tiny Attacher at the top, so it will not show behind the flower. Next time I will attach the flower using the brad instead of the adhesive since it shows through. 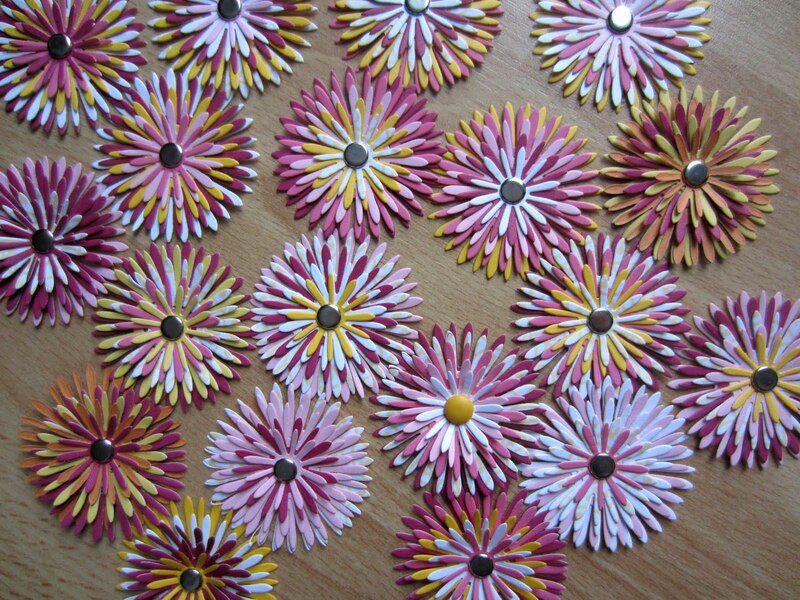 Cut flower shapes out of many colored papers. Love the Bloom Builders #3 die! Combine the colors and just stack 'em up to get an awesome flower. So quick and simple. Use a brad to hold them all together. 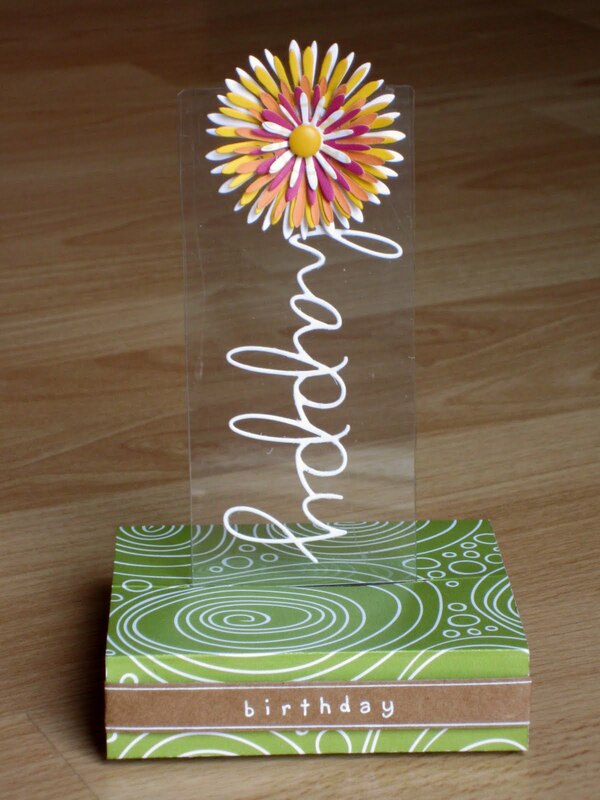 I bend the petals up slightly on the layers to make it more dimensional. 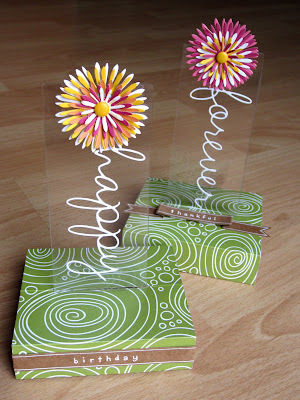 Attach the flower over your staples at the top of the acetate so it just overlaps the word. 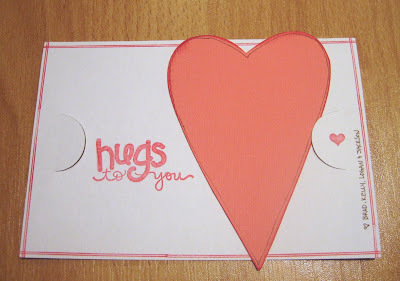 Cut out and attach the rest of your sentiment. 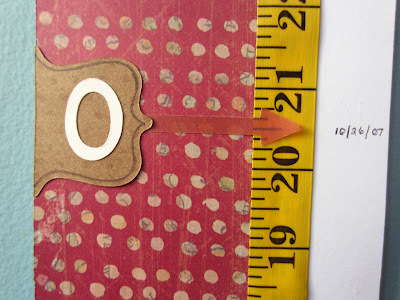 Initially I used the Papertrey Double-Ended Banner die, but I needed it a little longer so I just cut a 1/2" strip of paper and notched the ends with the corner of a square punch. 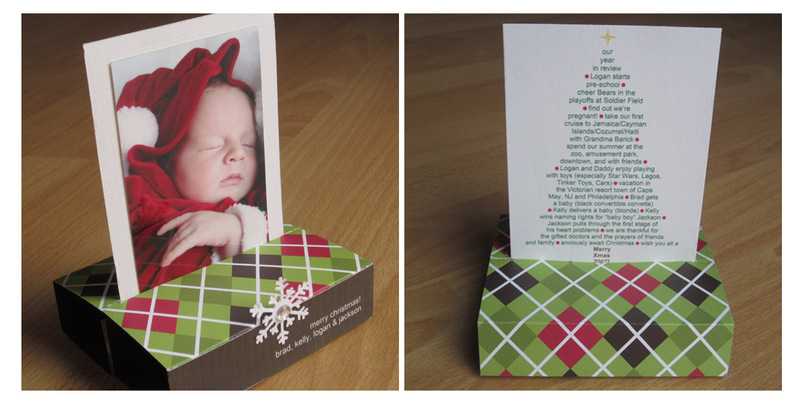 My favorite part is collapsing the card after you're done. Amazingly it folds nice and flat. Perfect for fitting into an envelop. Then to re-open it you just pull the acetate. With the word being vertical I like how it is revealed as you pull it open. Then the rest of the sentiment is on the base. OK, now I'm off to make 13 more! They do go quickly. You can get 3 bases from a 12x12 paper, so I make the score marks first, and then cut the sheet into thirds. Saves a couple steps! Oh, one other tip. I saved the clear packaging from some candles I bought at Costco. It's nice and thick. This is what I used for the card. It's large so I'll probably get 7-8 from one package. 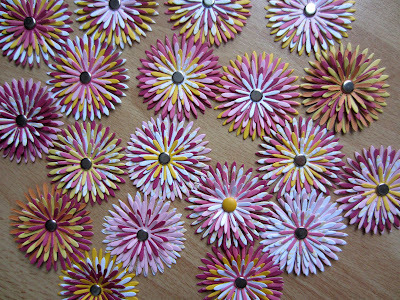 Paper is American Crafts bought in bulk from Tuesday Morning. Please let me know if you have any questions. I'd be happy to try and help! Thought I'd share a method of organizing ribbon that's worked for me over the years. Aside from being very functional and taking up little horizontal space (which is at a premium in our house), it's 1) simple and 2) free. Perfect! All you need is a wire hanger (the white flimsy ones from the dry cleaners work well) and, well, uh, ... ribbon! Straighten it (except the top hook of the hanger, leave that the way it is). 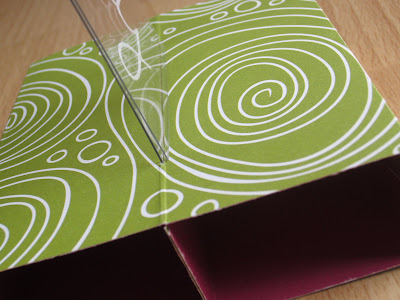 Add your ribbon and bend the bottom wire at a 90 degree angle to keep the spools from sliding off when it's hung. Since the spools turn, this storage method allows you to pull the ribbon with one hand and cut your length of ribbon with the other. Very efficient. 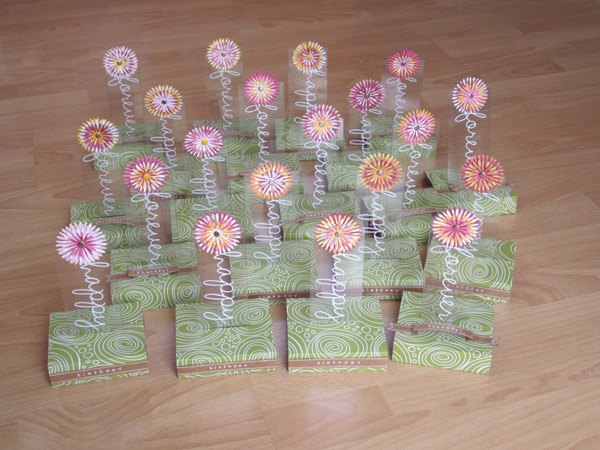 One tip is to organize your ribbon BEFORE putting them on the hanger. Trust me. They are a PAIN to resort once there are 50 spools stacked up. 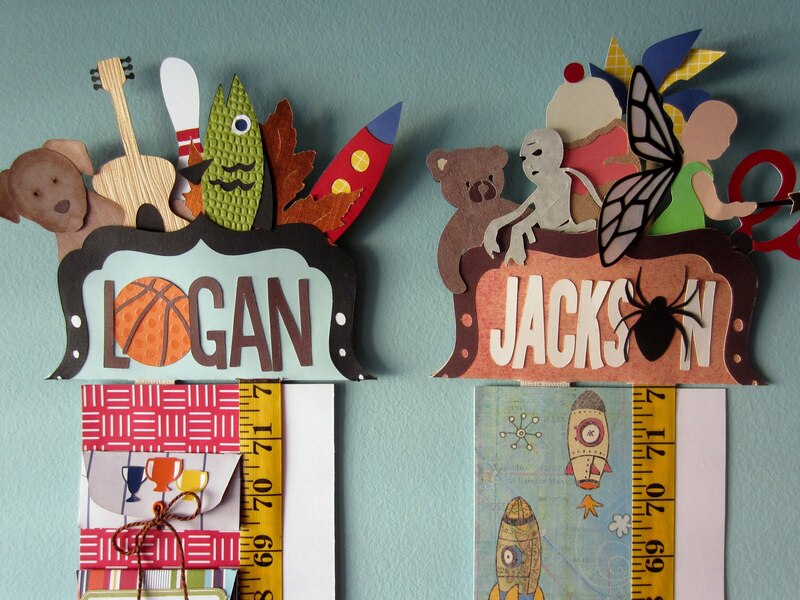 You may want to organize by type (grosgrain, satin, embroidered), color, occasion (kids, holidays, wedding), pattern (stripe, solid, dots, checked). 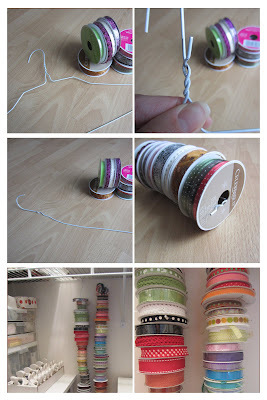 When the spools are all on the hanger, just hang the stack of ribbon where it's convenient. For years I've had them hanging from the side of a bookcase. Here they are hanging from the bottom of a wire shelf in a closet. You could also mount a towel holder on the wall. Hang them behind a door. From the hinge of a cabinet. Whatever works for you. When you need to add more spools (like when there's a really good sale and you MUST stock up) just lift the stack from the bottom and feed the new spool from the bottom. Most times I manage to keep the hanger bent at 90 degrees while doing this. If that's not possible (like when the hole in the middle of the spool is too small, or the spool is too thick or your hanger is a sturdier kind that's not flexible at all) just bend the hanger straight, put the spool on, then rebend it. You can do all this without removing the stack from it's hanging spot. 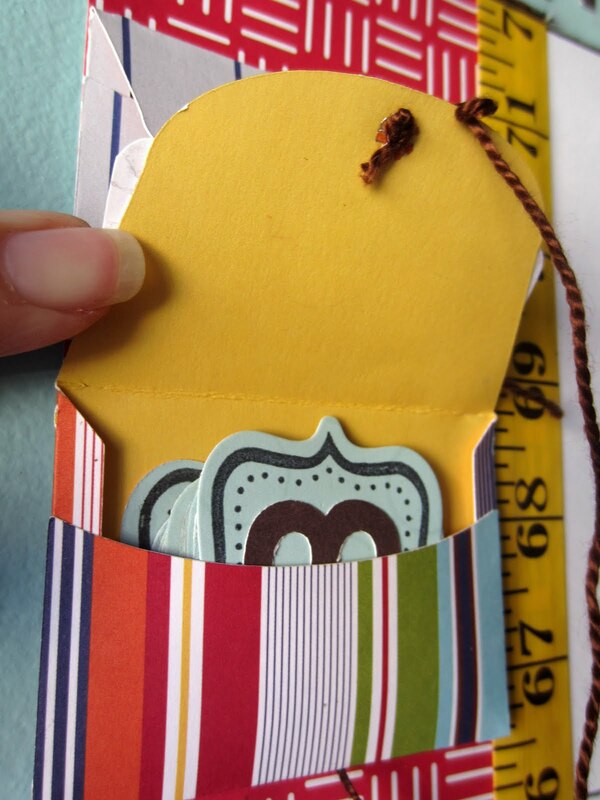 Another tip is to store any scraps of ribbon that you don't end up using between the spools. In the photo above, see the green and white checked ribbon sticking out? That's a scrap that never got used. So instead of throwing it out, I slid it between the spool it came from and the one on top of it. In the future if I need to see what that ribbon looks like for a project I'm working on, I just yank it out. If it works I'll cut the length I need from the main spool (usually these are just short scraps for eyeballing things). 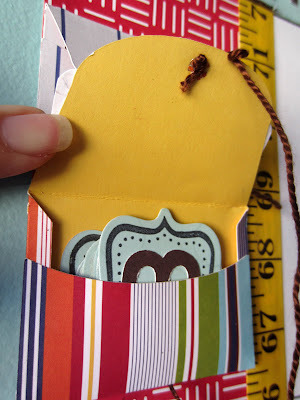 All in all, this is a very functional way for me to store ribbon. It's easy to use, easy to expand, easy to add another stack (just head to your closet), and easy to fit into wherever you have the space. They're at it again. That growing thing they do so well. For awhile now I've wanted to track the growth of our boys, and in a way that we could take with us to a new house (way too sentimental to leave marks in a doorway behind). 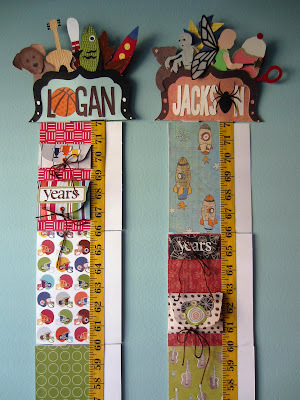 So I created a pair of growth charts for each child. Perfect opportunity to use my scrapbooking papers and have them out where I can see them! The back of each "favorite" has their name, age, and reason why we've included it. We'll keep adding things throughout the years as they grow older. The boys love looking at (and playing with) their favorites, and in the future it will be a nice time-capsule of what they liked. The chart itself is made up of 6" segments. 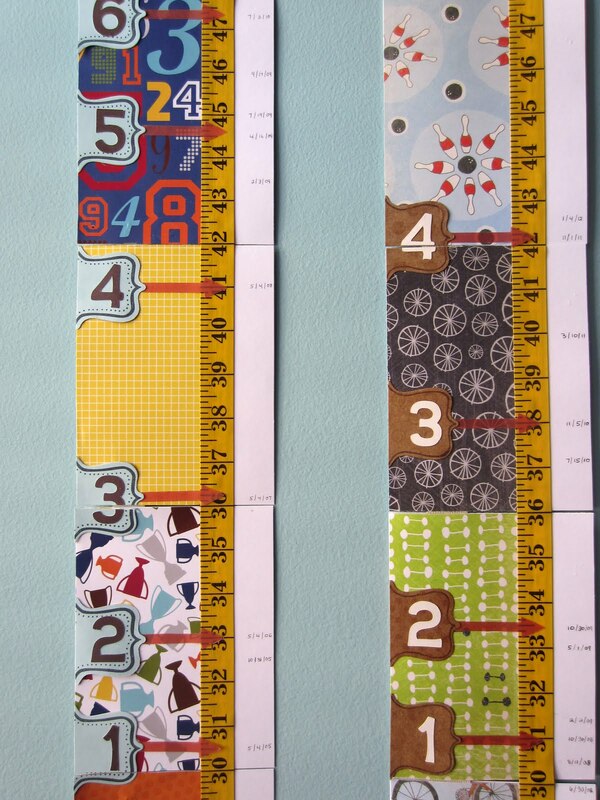 I got a 10 foot coated measuring tape from Wal-Mart ($2) and used that to connect all the segments. I tried leaving about 1/16th of an inch in between segments so later it would fold up. When they're all grown I plan to fold the charts up into a mini album (no extra work for me!) and give it to them. Maybe I'll adhere a 4x6 photo to the back of each section for their particular stage. For each birthday I have their age pointing to the measurement with a red vellum arrow. This makes it easy to see at-a-glance which years had the biggest growth. It's also a quick comparison to see who is taller at each age. Interestingly, the younger brother (brown labels) is taller. Never would have known that without the charts. Can't forget their actual birth day! I give that a "0" label. To make the charts easy to maintain, I pre-made the remaining years (through 18 years old) and arrows. 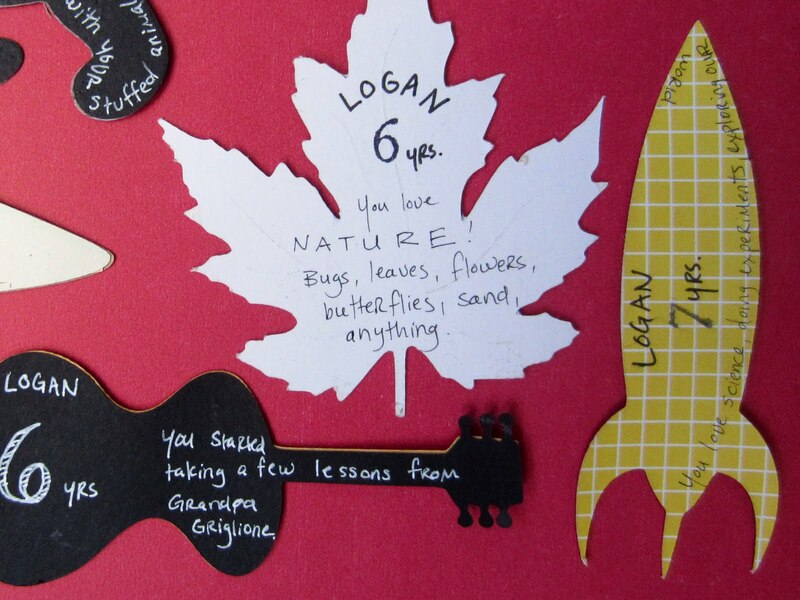 These are all stored in their own envelope mounted at the top of the chart. This means I have no excuse not to keep up on this one! 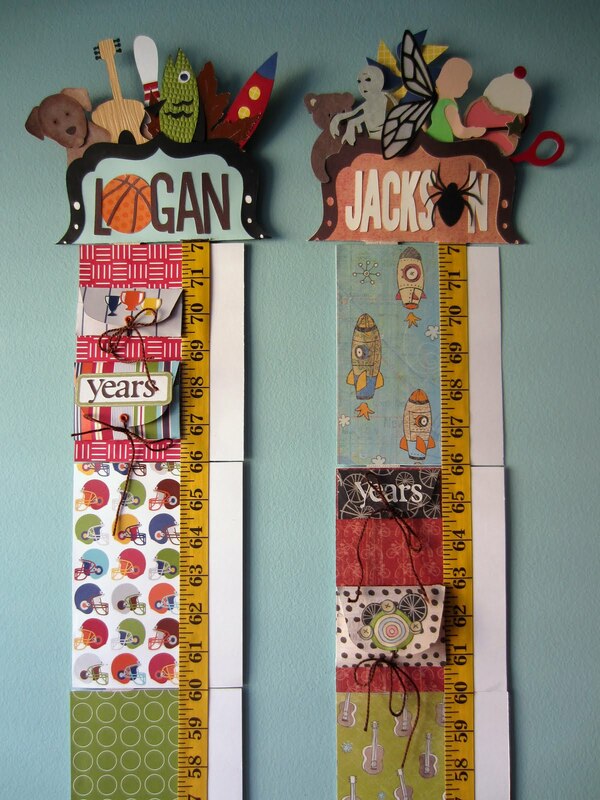 I tried it out this morning by updating Jackson's 4 year mark and it took all of 2 minutes to tape on (maybe 3 minutes since I had to cut the "4" in half where it crossed the segments). Easy, and done. I love having this in their bedroom where it's easy to keep up. Being visible is key. Initially I planned on keeping this on the end of our wall in the kitchen and family room. That spot was a little TOO visible though, and kept getting knocked around. Hanging in their reading nook in the bedroom is a much less trafficed area, yet still somewhere that we won't forget about it. 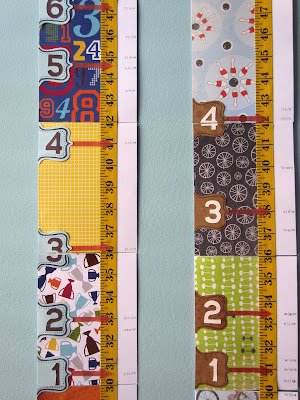 Since I only recently started this project, there were quite a few years that I didn't have measurements written down. Luckily our pediatrician's office didn't mind helping out and they kindly read me all the measurements I was missing. I love having a workable, easy to maintain plan for recording their growth, and also knowing that it will quickly convert to a mini album for them to keep when they are grown up.